floors, exhibit spaces, beer gardens or wedding ceremonies. We carry 250sqft of light coloured bamboo floor and will deliver synthetic grass when other items from our inventory are also rented. Floor available in multiple formations using a 3ft x 3ft overlapping system. The smallest size available is a 9ft x 9ft square. 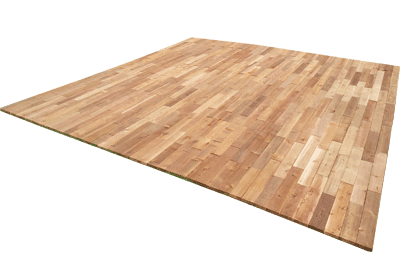 Great for a rustic dance floor or to provide solid surface in grass or other uneven environments. be made for Sizes not divisible by 5ft. Placement on Even Surfaces Only Unless Sub-Floor is Provided. Custom Event Rentals provides synthetic grass only when other decor items we carry are also ordered. If you just need to order synthetic grass, we will refer you to our supplier. Available in 6ft wide increments. Cutting fees will not apply for 12ft, 18ft, 24ft, 30ft, etc... widths.